The affordable way to transfer handguns and restricted rifles while exploring your local ranges. The BC Firearms Academy Gun Club at its core provides shooters with an affordable way to transfer restricted firearms into their inventory while supporting and growing the shooting sports in Canada. Working closely with local ranges, retailers and the RCMP firearms program, the BC Firearms Academy Gun Club is an affordable way to always meet the RCMP legal requirements. 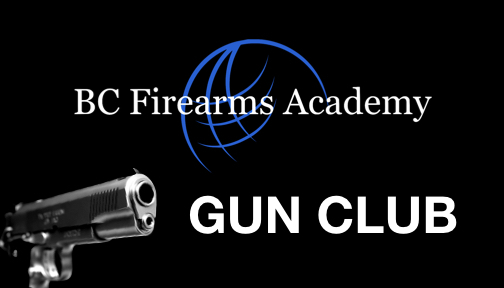 With your BC Firearms Academy Gun Club Membership, you will be able to Transfer Restricted Rifles and Handguns. BC Firearms Academy offers flexible options for our members, never forcing you to purchase items you don’t need and likely already have. The perfect solution simple, easy and affordable. I was hoping this would become available before my PAL arrived and luckily it did. I registered in person at BC Firearms Academy in Cabela's. Can't wait until the waiting list at my range opens up, but I'm super happy to have this Club as an option. The Gun Club An affordable membership option for new shooters, collectors and those waiting for access to range memberships. You choose the options you want Choose the level of membership that's right for you! Flexible Choose the length of time you want, from 1 to 5 years. RCMP Mandated With your BC Firearms Academy Gun Club Membership, you will be able to Transfer Restricted Rifles and Handguns.